Silo Bangoura is a Guinian musician. While playing the Kora, Sibo sang a traditional West African song, Nan Fulie, about the importance of the Griot people – the West African musicians, storytellers, custodians and teachers of tradition through music and dance. He finishes with an improvisation on the Djembe. 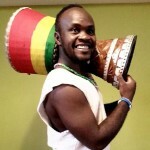 Sibo Bangoura is a Griot (musicial family lineage) from Guinea, West Africa now living in Australia and sharing the traditions of his musical heritage with people all over the world.